FHA appraiser William R. Pruett, SRA has a problem that we’re sure you can relate to. Pruett, appraising 12 years, five in West Des Moines, Iowa, knows what a “customary and reasonable” fee is for an FHA 1040 in his market and so does everyone else, he says, except the large national bank and its in-house AMC (appraisal management company) that cancelled Pruett’s order when he asked for the full fee. The report was ordered after the February 15 implementation date of FHA Mortgagee Letter 2009-28, which among other things, requires that appraisers are paid “customary and reasonable” fees. Pruett complained to his local FHA Resource Center and after some wrangling was given an address to file a formal complaint (see below). Last fall, FHA announced new regulations which borrow much from HVCC (Home Valuation Code of Conduct), including support of appraiser independence and a prohibition against mortgage brokers or lenders ordering reports directly from appraisers. HVCC does not cover FHA appraisals. The guidelines also include requirements to correct some of the unintended consequences of HVCC, including widespread reports of appraiser selection based on the lowest bidder instead of the most qualified professional, in many cases. 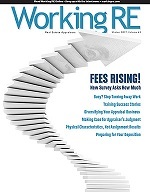 According to the Working RE/OREP HVCC Appraiser Talkback Survey, with over 5,300 appraisers responding, 98 percent say that, in their experience working with AMCs, appraiser selection is based solely on obtaining the lowest fee at least some of the time (less than two percent answer that appraiser selection is “never” based solely on obtaining the lowest fee).